Above & Beyond CGM can install both sprinkler and drip irrigation systems in new or existing Omaha commercial landscapes, but making the best choice depends on many variables. 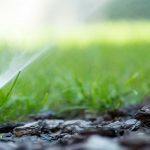 It is essential to explore the differences between these available irrigation methods as well as the pros and cons of each to make the best decision for your commercial location. Drip irrigation is based on a system of pipes, tubes, and emitters which slowly trickle water directly to the soil in and around the root zone. These pipes and tubes are highly configurable and can be arranged in customized patterns that fit the layout of the Omaha landscape. There is also a variation in drip irrigation called subsurface drip irrigation. With this method, drip irrigation is installed underground, creating efficiencies in water distribution and minimizing the potential for evaporation. Drip irrigation systems are celebrated for their ability to conserve water and are touted as an energy-efficient way to irrigate an Omaha commercial landscape. There is also considerable flexibility in the way the pipes and tube valves can be configured, making them ideal for gardens, flower beds, medians or places where ground cover is planted. Drip irrigation can also aid in reducing the prevalence of weeds, reduce the risk of fertilizer runoff and minimize erosion. There are a few potential disadvantages to drip irrigation, which include tubing to be damaged by environmental factors such as weather and sun. Tubes can also become clogged if proper filtering isn’t in place and this method is not able to be used for frost control measures. While drip irrigation is relatively “low-key” (often going unnoticed when in operating mode), this isn’t the case for sprinkler or spray irrigation systems. With sprinkler systems, water is emitted through a network of pressurized spray heads and rotors that distribute water through the air. The spray heads and rotors are typically arranged in zones and are configured to run on a predefined schedule set by the property manager or business owner. For Omaha commercial properties, sprinkler systems are ideal for covering large spans of landscape or lawn. The system can easily be programmed to run on a convenient schedule and provides consistent water distribution to the needed areas. Spray patterns can be adjusted as needed and with newer smart irrigation options, can even be programmed to run when conditions are dry and to shut off when it’s wet or rainy. Commercial sprinkler systems require ongoing maintenance and attention to keep them running optimally. Broken or ill-aligned heads or programming controller issues can cause the system to fail if not properly maintained. Because sprinkler systems emit water above ground by spray, there is also the potential for water loss due to evaporation or wind. If you are looking for a new or replacement commercial irrigation system, call our Above & Beyond CGM Omaha landscape and irrigation experts at (402) 934-8866. From detailed water use and analysis to planning cost-effective and sustainable irrigation options for your Omaha business, we are here to help.